This article was written by Lauren Williams, published on 15th April 2013 and has been read 6340 times. Amiens is the capital of the Somme department of Picardy in northern France, situated somewhere in the middle of an imaginary triangle that holds Paris, Lille and the coast at its tips. With a population of roughly 140,000 it is by no means the small, rural city that many believe it to be, and whilst the first thoughts of many will be of the large, gothic cathedral that sits as the city’s centrepiece, or perhaps the Somme battlegrounds, this is by no means all Amiens has to offer. L’université de Picardie, Jules Verne, has around 25,000 students. The main campus sits on the outskirts of the city but other faculties are dotted around Amiens city centre, such as the science and law buildings. Accommodation is offered via CROUS with many residence halls being situated in the centre of town as well as on the main campus. Small apartments are available through the private sector, although this is nothing like university housing in the UK, for example, they are rarely furnished and it is near impossible to find accommodation designed for more than two people sharing. In addition, it is very dependent on the housing agent you choose, with some refusing to let to foreigners or students without a French guarantor. French student lifestyle is very different to that in Britain, with most studying very hard in the week before returning home for the weekend (complete with dirty laundry, of course). For those who do choose to have a social life, the quartier St Leu is the place be. This area is situated very near to the cathedral on the banks of the canal - a truly beautiful scene on Summer nights when the numerous restaurants and bars move their services onto the cobbled streets outside. However, even on the weekends, the bars are not often busy until midnight with people venturing to the clubs such as le Mex and le Lipstick at around 2am - in France, nightclubs stay open until around 6am so there’s no rush! Thursday night is ‘student night’ but don’t expect a Jagerbomb for 2€ - student prices do not often include spirits, with the average vodka and coke being around €7, but instead feel free to indulge on beers and wines which cost from around €2. If you are struggling to meet new people, make your way to the Irish bar called My Goodness where you will find a good mixture of both French and English voices, friendly bartenders and decent drinks. Amiens cathedral cannot be missed - quite literally. The UNESCO World Heritage Site is the tallest complete cathedral in France and dates back to the 13th century. It is possible to look around inside where you will find magnificent stained glass windows, memorials dedicated to those who lost their lives during WWI, and, for some strange reason, a replica of St John the Baptist’s skull. It is also possible to climb to the top of the towers, something which is free for people up to the age of 25 who are citizens of one the 27 countries of the EU. Furthermore, as you may (or may not) have guessed by the name of the university, the renowned author Jules Verne was a longtime resident of Amiens. This is perhaps ‘milked’ by the city, with what seems like every second building being named in his honour, such as the cirque de Jules Verne or the brasserie Jules. His former house has since been turned into a museum (La maison de Jules Verne, believe it or not), and his gravestone at the cimetiere de la Madeleine is something you really have to see to believe - trust me. Finally, as I am sure you are aware, the city sits a mere 20 minutes drive from the centre of the Somme battleground of WWI. Some of the deadliest battles took place here and the monuments really are a must see for anyone wishing to pay their respects - the fields and fields of anonymous white crosses is something that will never leave your mind. Tours are organised from the local tourist office, but if family are visiting by car then I would suggest this would be the best means of visiting the the sites. In addition, it is possible to take the train to the local town of Albert which offers various wartime museums, including Le musée Somme 1916 d’Albert. Amiens takes pride in its city centre shopping district, a pedestrianised area that leads from the train station to the hotel de Ville. Here you will find many shops, ranging from international clothing chains such as Zara, H&M and New Look to gadget shops like FNAC, from local patisseries to the national department store, the galeries Lafayette. The majority of shops open at 9am and stay open until around 7pm on weekdays and Saturdays (the smaller ones do break for lunch), and do not open at all on Sundays. Food shopping can be a stressful experience wherever you are, so it is important to suss out your local store. At the centre commerical nord you will find a large Carrefour, whereas at the centre commercial sud there is a large Auchan. Both are similar to Tesco or Asda in the UK, and are accessible via a 20 minute bus journey from the town centre. Within the city itself there are small shops dotted about, such as Carrefour Market, Carrefour City, Match and Monop’. These are perfectly fine for doing the weekly groceries, being similar to perhaps a Tesco Express in the UK, but don’t forget your bag for life as it is likely you will have to pay for plastics! These shops are open from as early as 6am to as late as 10pm on weekdays and Saturdays, depending on the store. If you’re lucky, your local will open until lunchtime on Sundays - it really is a big deal when they do this, as, in France, Sunday is the national day of laziness. Amiens has a number of activities available to the bored student. Firstly, there is a large, municipal ice rink and swimming pool situated in a building called the Coliseum. This is behind La maison de la Culture, which itself is also worth a visit, especially if you are into exhibitions, theatre or arty films. The ice rink also plays host to the local (and very popular) ice hockey team - les Gothiques - which is really worth a visit. The city has a zoo, which is around a 20 minute bus ride away from the city centre. It is important to find out the opening times before you leave however, especially during Winter. This information is available at the tourist office or on the internet. It may not be as thrilling or exciting as West Midlands Safari Park or Chester Zoo, but is has a number of animals such as penguins, zebras and elephants, as well as a small petting zoo. In addition, you get a pretty good discount if you are a student. There are a number of cinemas in town also. I have already mentioned the Maison du Culture for arty films, and these are also available at the Ciné St Leu, which is just opposite the law faculty of the university. The local multiplex is the Gaumont-Pathé, which is next to the train station. This is similar to a Cineworld or Odeon in the UK, showing both French and English-language films. It is possible to find out movie times and if a film will be shown in VO (version originale) or VF (version française) by looking on the website. Finally, there are many options available to you gym bunnies or sports addicts. For students, the university has many sports teams, ranging form team activities like football, rugby and volleyball, to individual games such as tennis and golf. These take place on the main campus on the outskirts of town. Be aware that you are likely to be asked to provide a medical certificate when signing up. Furthermore, there are various gyms around the city - ironically, you are unlikely to walk far to find one. At Planete Forme, both use of the gym and classes such as Zumba and aerobics are included in the student price, which is something that is also offered to stagiaires so long as you can provide proof that you are a student in the UK and that you will be in Amiens for the entire academic year. This is where Amiens really shines. It is very easy to get around the city itself, with a regular bus service run by Ametis. Furthermore, the location of the town enables easy access to Paris, Lille and the coast, each being roughly a 1 hour 15 minute train journey. The train to Paris takes you directly into the gare du Nord, from where you can explore Paris via the metro or get the Eurostar back to Britain from the station itself. It is also possible to get the Eurostar from Lille Europe station, which is a 5 minute walk from Lille Flandres station, where the Amiens train arrives. Trains in any direction cost around €21 at the most if you are under 25, but you can purchase a carte de réduction jeune either at the station or online for €50 which gives you 25-60% train journeys depending on the time. 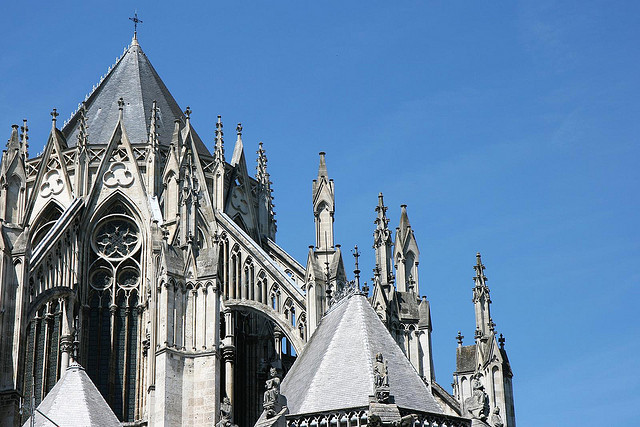 In addition, Amiens is only a short journey from the Parisian airports of Charles de Gaulle, Orly and Beauvais-Tillé. Whilst Beauvais-Tillé is only some 60km from Amiens, it can be harder to get to as the bus service from Beauvais train station to the airport is somewhat unreliable from past experience. However, both CDG and Orly are easily accessible from Paris’ Gare du Nord through means of the RER or the metro, with direct access to CDG also being possible via TGV, France’s high speed train service. Amiens really is one of the most underrated but accessible cities available for your year abroad. It does not have a large Erasmus population so you are forced into speaking the language, but you do not feel threatened into doing so. It is a completely different culture to that of Britain, but that’s what makes it so exciting. So don’t shrug it off at the ‘small, cathedral town’, but instead think of it as a city waiting to be discovered - by you.